Welcome to the Mesh Animator documentation page. Mesh Animator is a toolset for converting and fully animating characters, animated assets, or any other kind of skinned mesh. 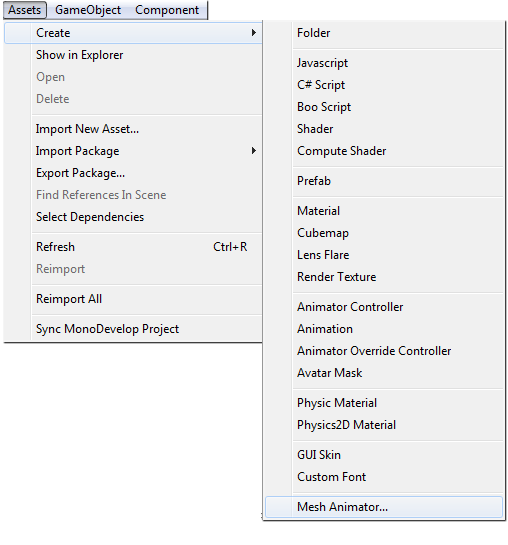 Below you'll find resources on how to use Mesh Animator and all it's features. To report any bugs or for questions not covered in the documentation, please e-mail jschieck@gmail.com. Asset to Bake - The parent object you want to bake. Animation Controller - You can supply an animation controller, and all clips used in that controller will be baked. Avatar - If baking a humanoid prefab, this option will appear. Designate the avatar used by the asset. Root Motion Mode (beta) - If baking a humanoid prefab, this option will appear. It can be used to apply root motion to the mesh or transform. None - No root motion will be applied. Baked - Root motion will be baked into the mesh, but not move the transform during playback. Applied To Transform - Root motion will be applied the MeshAnimator transform during playback. Mesh Filters - Mesh Filters on the asset that should be baked. Skinned Mesh Renderers - Skinned meshes on the asset that should be baked. Use Original Mesh - If baking a single mesh, you can choose to use that mesh as the source instead of baking a new one. Exposed Transforms - This allows you to leave transforms exposed for parenting in the baked asset. Otherwise all children of the asset will be removed. Bake FPS - The sample rate at which the bake will happen. Bakes a frame every X frames. A higher rate means more accurate and smoother animation, but bigger asset sizes. Custom Compression - Turn on this option to enable custom compression. Compression Accuracy - Determines how many floating point numbers to store for vertex positions. When using Custom Compression, the lower the number, the more compression and less accuracy will occur. Accuracy = 0.001. Good for most animations. Use 0.0001 for even less compression. Accuracy = 0.01. Good for larger models or models not viewed close up. Accuracy = 0.1. A very low accuracy can be used to create animated models that look pixelated. Fast Normal Calculation - Use Unity's RecalculateNormals() method or a more complex method of recalculating normal angles. Use LOD - LOD levels can be used to reduce CPU overhead by updating the mesh less often. You can specify a distance and framerate to playback the animation. Global Frame Skip - Instead of baking animation every X frames, animations can be baked by skipping frames and then skipped frames are smoothly interpolated at runtime. This significantly reduces asset sizes but can result in poor animation quality. Add Custom Clips - Add custom animation clips to bake, helpful for baking on prefabs or objects where the animations aren't automatically detected. Per Animation Frame Skips - Individual animations can skip frames during baking. Once the settings are correct, click Generate Snapshots. This will bake the animations out into MeshAnimation assets. **NOTE** - If your skinned mesh's pivot is not facing Y up, it's rotation may appear off until playback begins. This is because all weight information is lost during baking. Once baking is complete, the following assets will be created. Each animation will get a MeshAnimation asset and a MeshAnimator prefab will be created. Rebaking the same asset will update existing MeshAnimation files and create a new prefab, so it's good practice not to use the generated prefab as your main asset, but rather a child of a top level prefab. The Mesh Animation is the asset that stores the animation info. Pre Generate Frames - All animation frames will be generated when the object is instantiated. Useful if you are spawning the objects during a loading screen. Playback Speed - The speed the animation will play. Changing this will change the speed for all meshes using this animation. 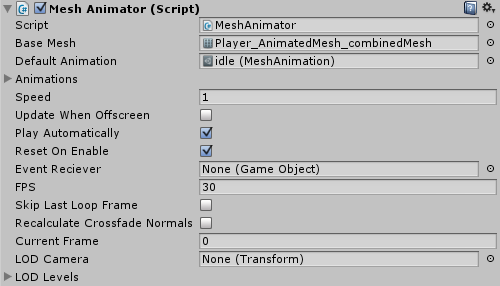 If you want to affect a certain mesh, set the speed variable on that object's MeshAnimator. Wrap Mode - See WrapMode. Frame Data - Stored frame data for the animation. DO NOT EDIT. Events - Animation events. These will be fired when a particular frame is played. These function just like Unity Animation Events. See Using Animation Events and AnimationEvent. Length - The length of the baked animation. The Mesh Animator is the main script that animates and swaps frames during gameplay. It functions similarly to the legacy Animation component. Base Mesh - The mesh used to generate frames. Default Animation - The animation played if Play Automatically is true. Animations - The array of animations. Speed - Playback speed of the animator. Update When Offscreen - The animator will pause while the character is offscreen, saving performance. Play Automatically - Animation will begin playing automatically. Reset On Enable - If the script is disabled and re-enabled, the animation will start from the beginning. Event Reciever - The object that will recieve AnimationEvents. FPS - The frames per second the animations were baked at, used internally for playback speed. 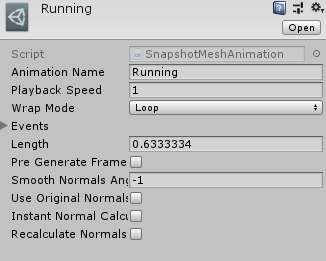 Skip Last Loop Frame - This will skip displaying the last frame of animation for looping animations. Recalculate Crossfade Normals - Calls RecalculateNormals() on meshes generated for in-between frames during a crossfade. Current Frame - Displays the current frame of animation displayed. LOD Camera - The camera used for determining distance for LOD's. If none is specified, Camera.main will be used. Mesh Animator functions much like the legacy Animation component. In it's simplest form, animations are played by calling the Play() method. The Mesh Animator has a few callbacks that can be used. With the convience of Mecanim's state machines, I've included an example MecanimMeshAnimatorController.cs script. This script looks at the current state of a Mecanim animator, and plays the appropriate animation on the Mesh Animator. State names MUST match the name of the MeshAnimation and blend trees are not supported. Since running an animator with it's own controller when it's not needed is excessive and hurts performance, I've also included an example state machine that achieves the same as the Mecanim controller but much more efficiently. With Mesh Animator, depending on the number of vertices, and number of frames in your animation, it is going to take up more memory than a traditional SkinnedMeshRenderer and Animator. Where you save is on the CPU. Finding a good balance between the two is important. 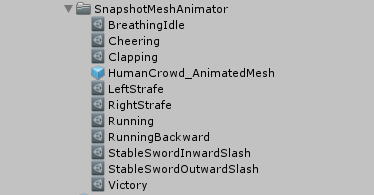 If a character has 5k vertices and 20 animations each a few seconds long, it's not practical to use Mesh Animator. The best use of Mesh Animator is with low-poly models with short animations. Each frame of animation is generated and copied from the base, this is why so much memory is needed for larger meshes and longer animations. A 4k triangle character (like in the example) takes up 500KB of memory. So to display a 1 second idle animation baked at 30fps, you would need approximately 15MB of memory. Memory usage is the same whether you are displaying 1 character, or 1000 characters. A character that has only 400 triangles takes 32KB of memory per mesh. So the same length animation would only take 960KB of memory. You can use this information to plan accordingly in your projects. Crossfading animations requires a temporary mesh to be created for the interpolation and adds a little CPU overhead for lerping the vertex positions. This overhead grows larger the more vertices your mesh has. The temporary meshes are pooled automatically so mesh animators sharing the same base mesh can use it. Crossfading a mesh requires at least 1 extra copy of the base mesh. All Mesh Animator scripts reside in the FSG.MeshAnimator namespace.